The "Someone's holding a contest!" plug. Someone's holding a contest! 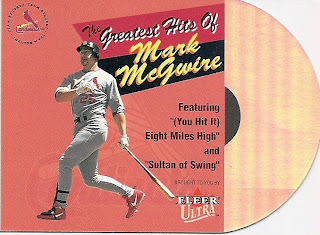 You have a chance at one of seven hits if you win. So don't enter so I have a better chance! Just kidding. And check out his new blog while you're at it! Well, kind of new - looks like that one had a false start in 2008 and was rebooted recently. Anyway, go check out Matt at The Diamond King! 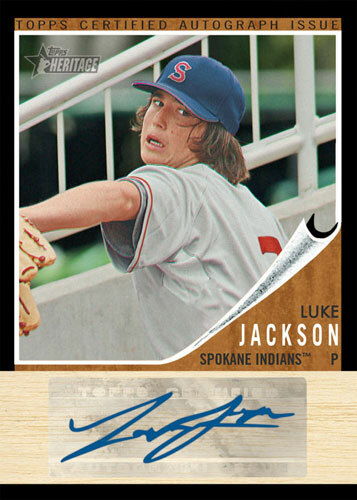 Tomorrow, Pro Debut is supposed to hit shelves. 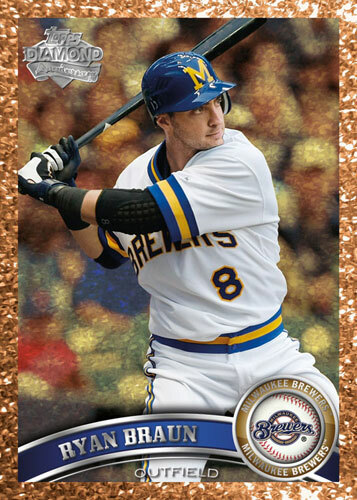 Then, Bowman Platinum. While Bryce Harper doesn't appear on the Pro Debut initial checklists, I'm sure he'll be in there somewhere; he's already on the Platinum sell sheets. 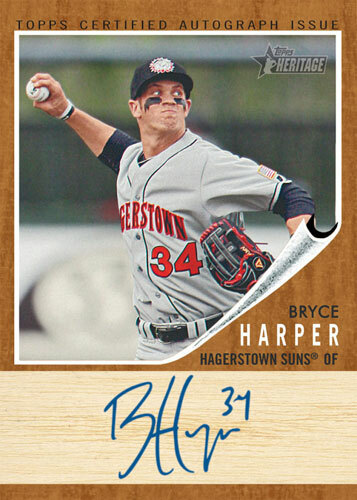 If you don't have enough Bryce Harpers by the end of June, just wait three months. 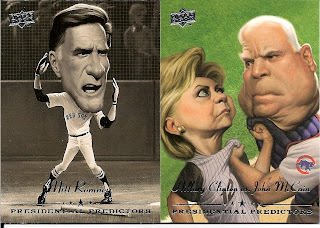 In September, you'll have another shot at Harpermania. So what will Topps bring us then? 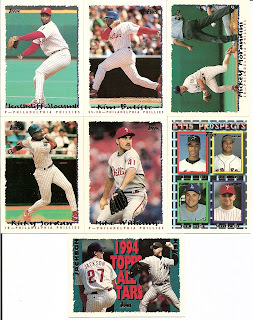 Why, it's Topps Heritage, the Minor League edition! Beckett announced the details today. I really don't care about this set. Rookies are young, hot, cutting edge. 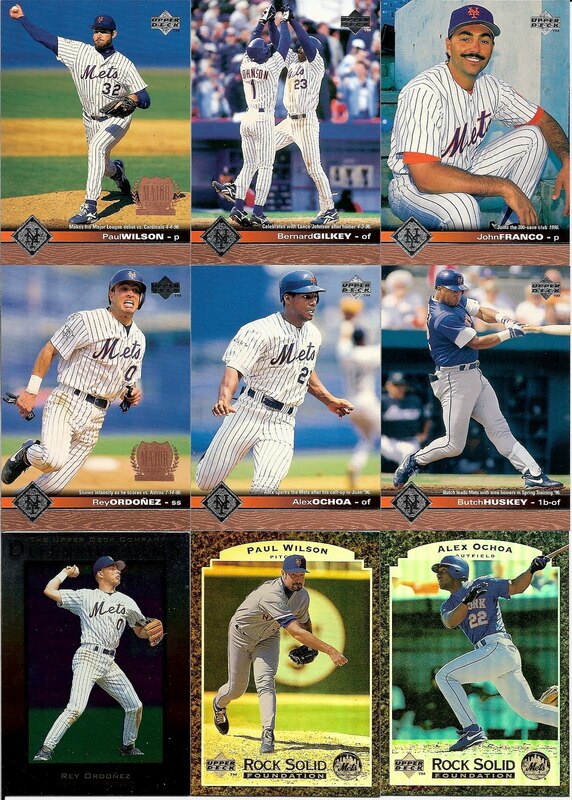 Heritage is old, vintage, reminiscing about veteran players and being a kid. I'd rather see them make a new design for a second minor league set - Pro Debut copies the major league flagship as well. What's next? Topps Tribute Minor League? 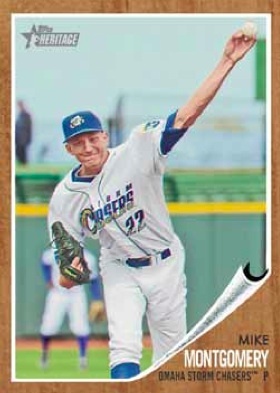 Bowman Minor League? Nice try, but that isn't attractive. At least the autograph appears to be on-card. That looks better. But again, it's minor leaguers! And by the way, this is a one-of-one. Any of the other (very limited) Harper relics will be from a base used at his first game. 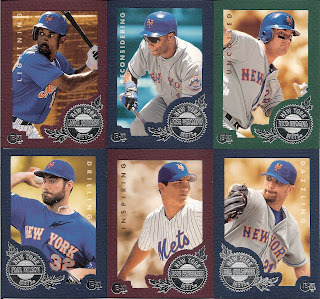 There are blue, red, and green tint variations of the base set, as well as black parallels. 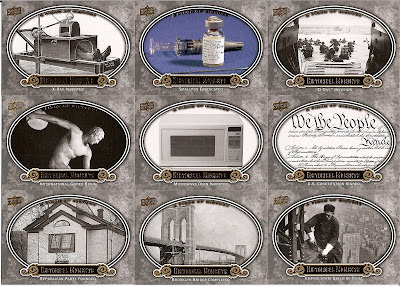 The autographs and relics are following the same parallel concept. It appears that there won't be any inserts to accompany the 200 card set, but 50 of the cards will be short-printed all-stars. Remember how those Harper autographs were on-card? Well lookie here. Stickers. 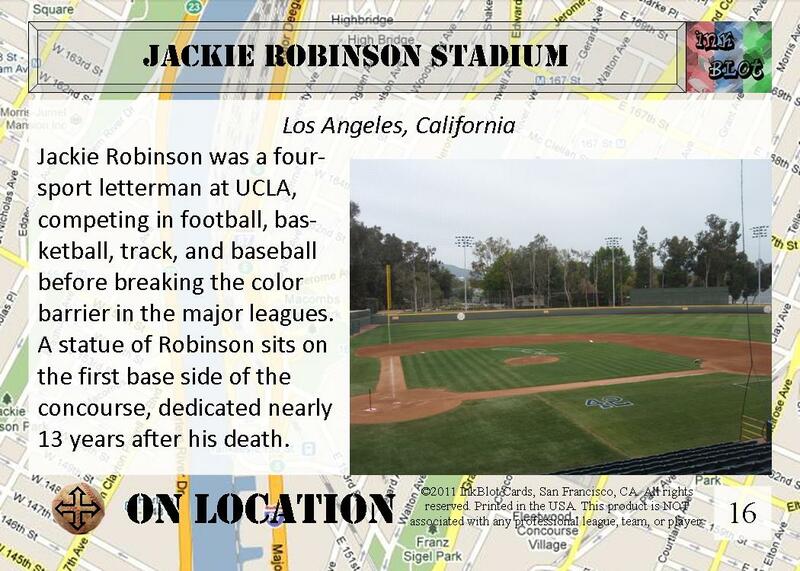 Is it that hard to travel to minor league stadiums and make the players sign the cards? Heck, pay me and I'll do it. Here's a sample of the black autograph parallel. Another sticker. I'm not into prospecting, and unless hobby boxes drop below $30 or someone sells their cards cheap, I'll wait a couple years and scoop up the cards I want when the players go bust. 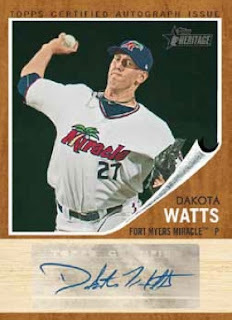 Topps, please do something special with your MiLB license. Porting your MLB releases to the farm just doesn't interest me. 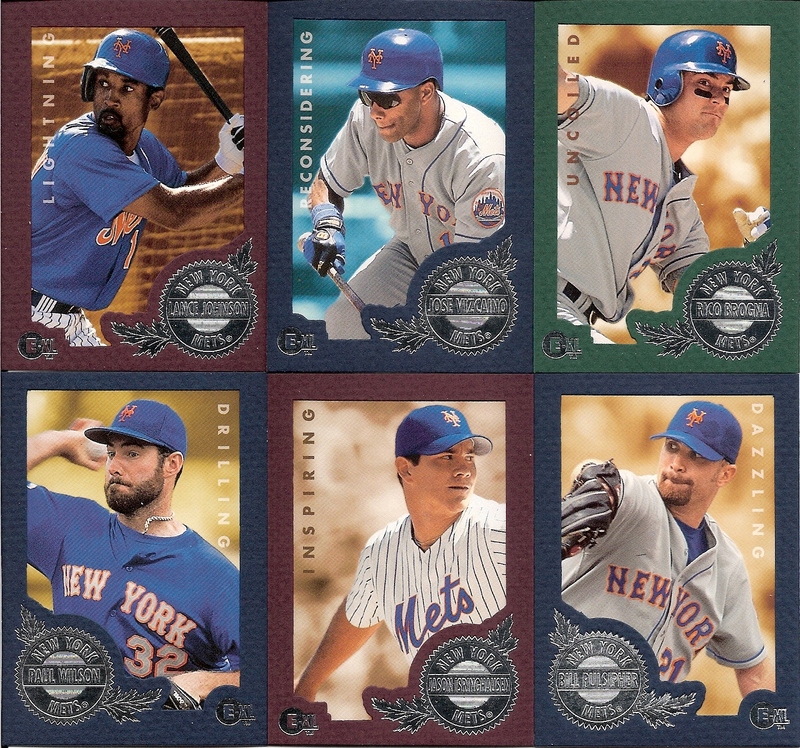 The New York Metropolitans on a Budget! I think the Mets should go retro and call themselves the Metropolitans again. 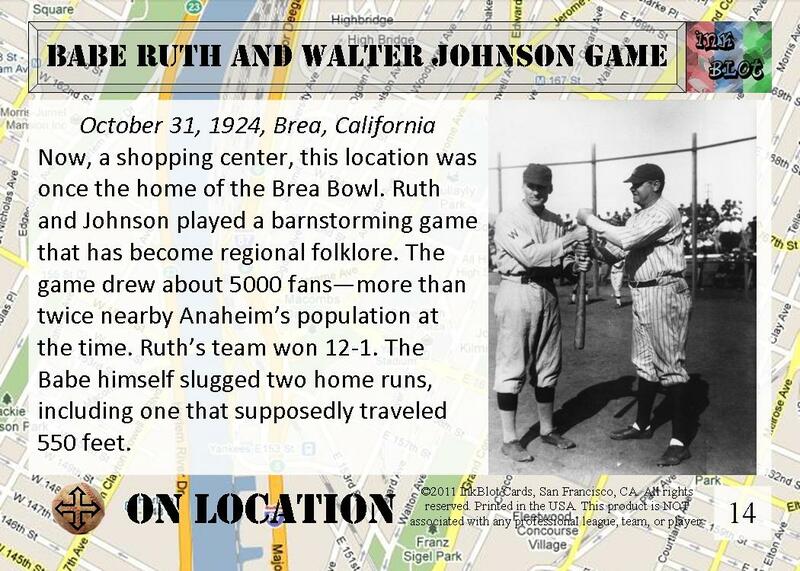 And the Dodgers should go back to the Trolley Dodgers, but that's a different post. 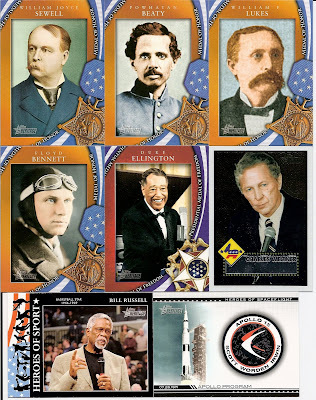 All these cards came from Colbey at Cardboard Collections in his May affordable group break. 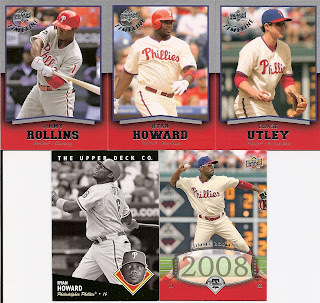 Yesterday I posted my goodies from the Phillies, although I ended up not needing any of the cards I pulled. Will my luck change today? 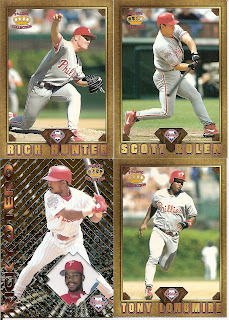 Okay, 1995 Topps, and again I have plenty of doubles. 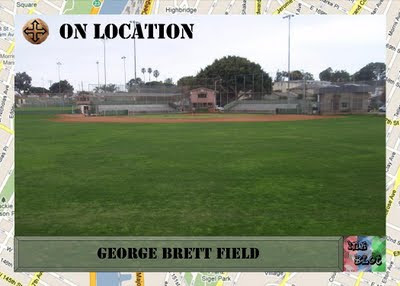 Hey, how many teams has Jeff Kent played for? I needed John Franco (Saves leaders)! Finally, success! These three Topps Cyberstats inserts/parallels are for trade! 1997 UD Series 2. The two Rey Ordonez cards go to the Gold Glove collection. The two Rock Solid Foundation cards on the bottom are for trade, as are the rest of the cards! 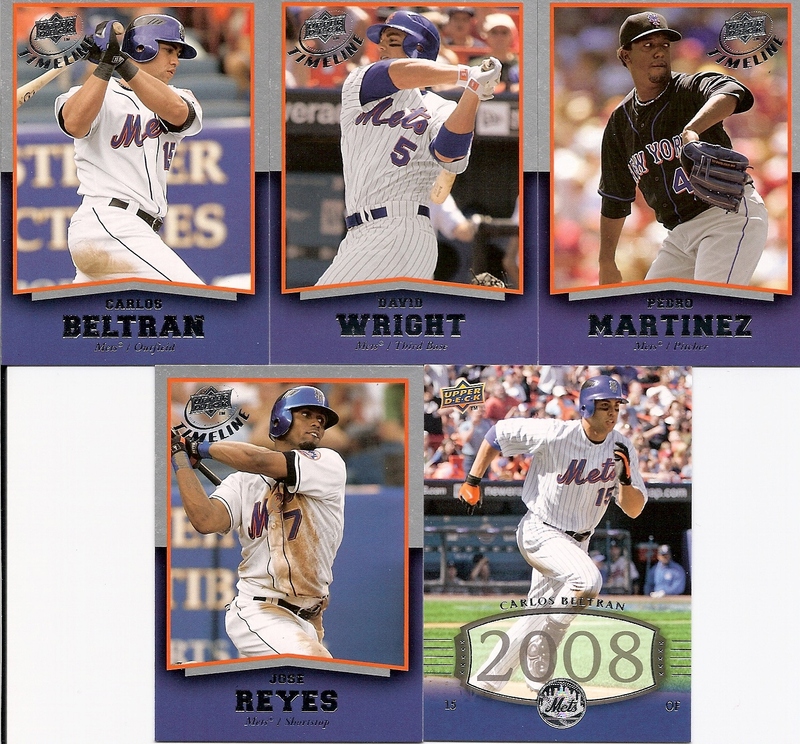 2008 UD Timeline - only one short print here. All these cards are for trade! 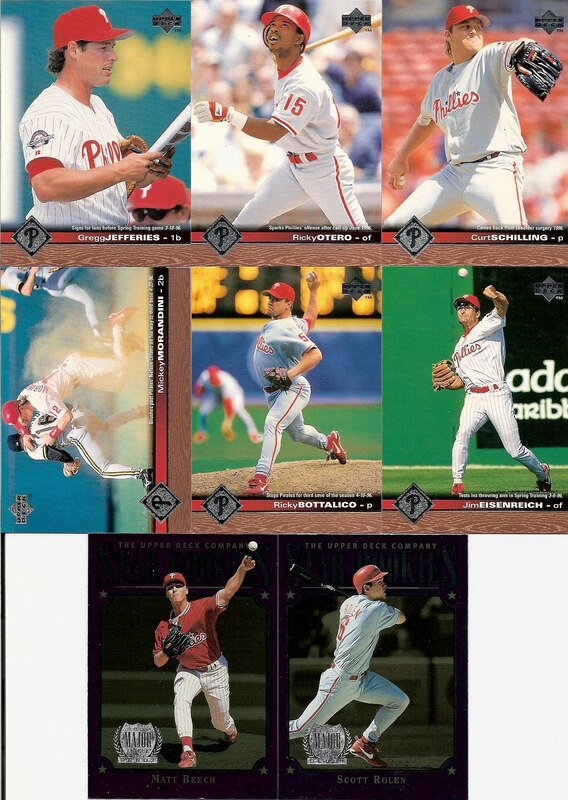 1997 Pacific Prisms - all for trade. 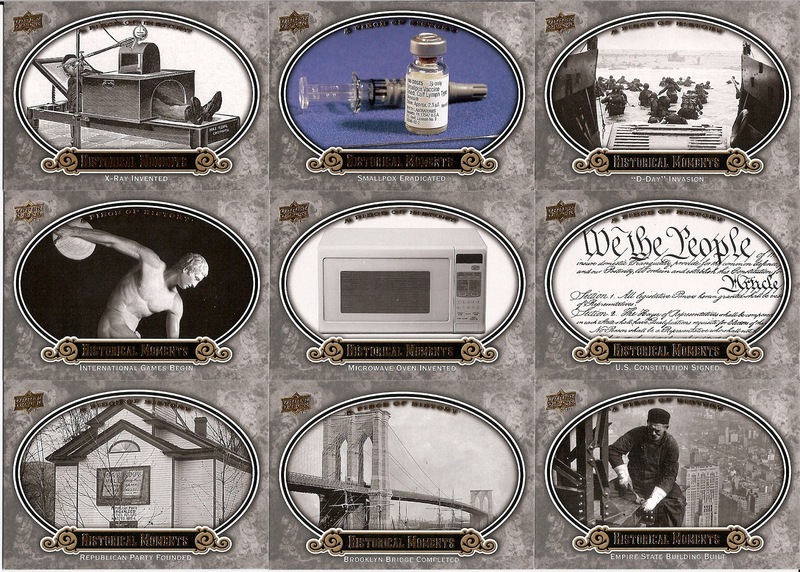 Last, the E-XL cards. The frames are a second layer over the photo, done in a matte finish, just like you would do to a photo before framing. Nice touch, but I'm not framing my E-XL cards. Well, the Mets did better than the Phillies in this break - 3-0. Hopefully some of my readers out there want the extras and we can work a trade? Check out my extensive lists! One of the great things about Colbey's affordable group breaks at Cardboard Collections is the ability to get a bunch of cards for a particular team fairly cheap. Really, that's the great thing about any break, but Colbey does his at Wal-Mart prices. Hits tend to be few and far between, but that's fine - I'm usually hoping for a little stack of cards to add to my Awards/Leaders collection and perhaps a couple inserts I need for the sampler collection. To avoid running up a ton of extras of players I don't need anymore and hopefully increaase my luck with the awards/leaders, I've been spreading my love across the major leagues, trying to pick different teams in each break. The first team I picked up was the Phillies. In general, I hated the Phillies. 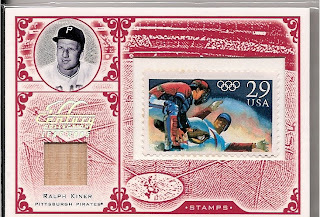 It goes back to the 1990s, when the Braves and Phillies were fighting it out for first place in the NL East, and we always heard about those nasty players in Philadelphia like John Kruk and Mickey Morandini, and mullet-headed Curt Schilling. Two of those guys are below. I don't hate them so much anymore. The team image has changed, and players I used to dislike on the Phillies have changed teams (Bobby Abreu, Pat Burrell - now with the Giants and I still don't like him). Like them or hate them, if they fit in the collection, I gotta have them. Let's see how I did. I scanned each unique card below, but I ended up with doubles and triples of some of the cards (mainly the Topps and Upper Deck packs). If I don't mention I need it, I'll trade it! 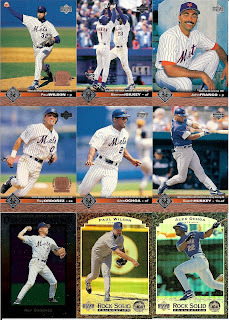 2005 Topps - got plenty of them! 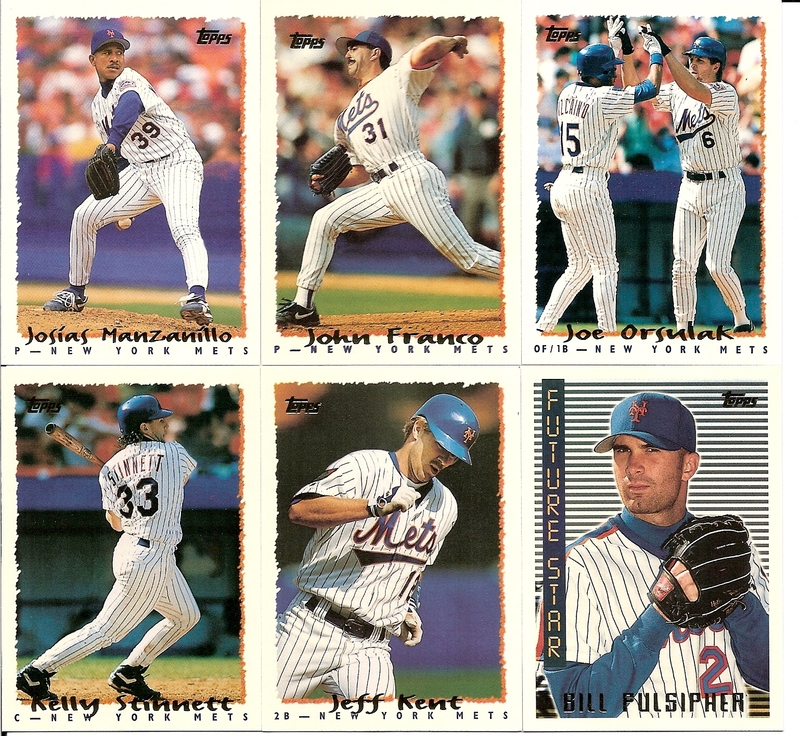 No inserts, and no Cyberstats parallels either. I didn't need any of these players. Terry Pendleton of the Braves gets a cameo appearance in the Eisenreich card! I always liked the name Heathcliff Slocumb. 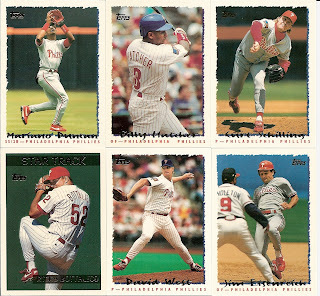 1997 Upper Deck - Series 1. I need one card to finish my set, but it's in series 2. Those two cards at the bottom aren't inserts, they're foil-shiny Star Rookies. I like the base cards in this set - above each player's name is a small caption and the date the photo was taken. 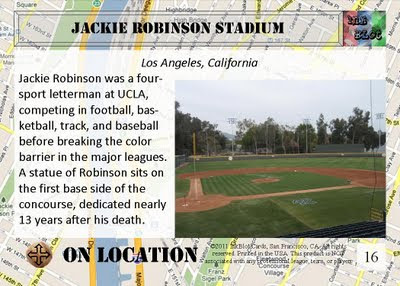 There's even a small writeup about the photo, on the back of the card (while the photo on the back of the card gets no caption). 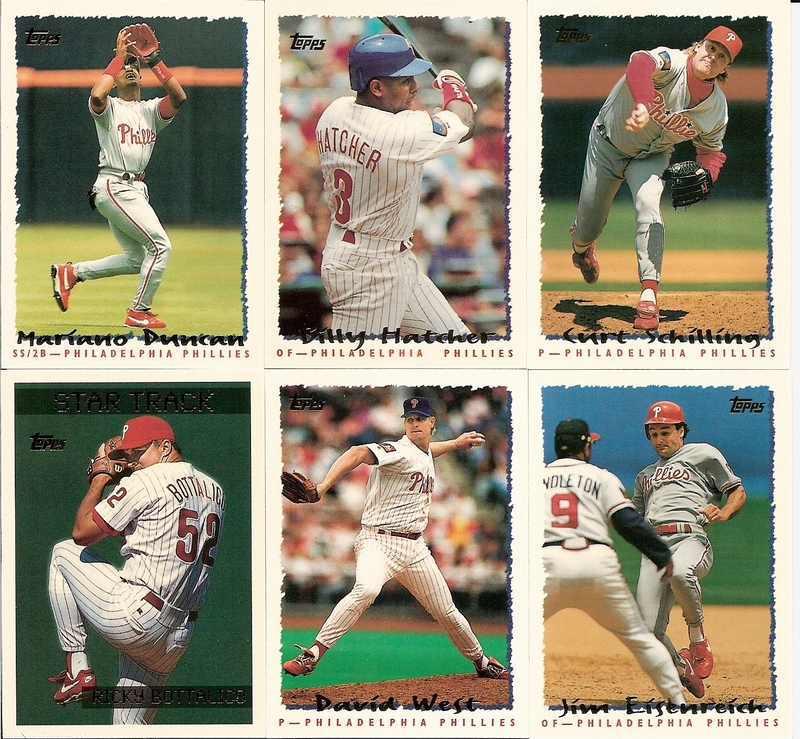 That Morandini card is a nice shot, but look at him push that poor Pirate out of the way. I didn't need any of these cards either! 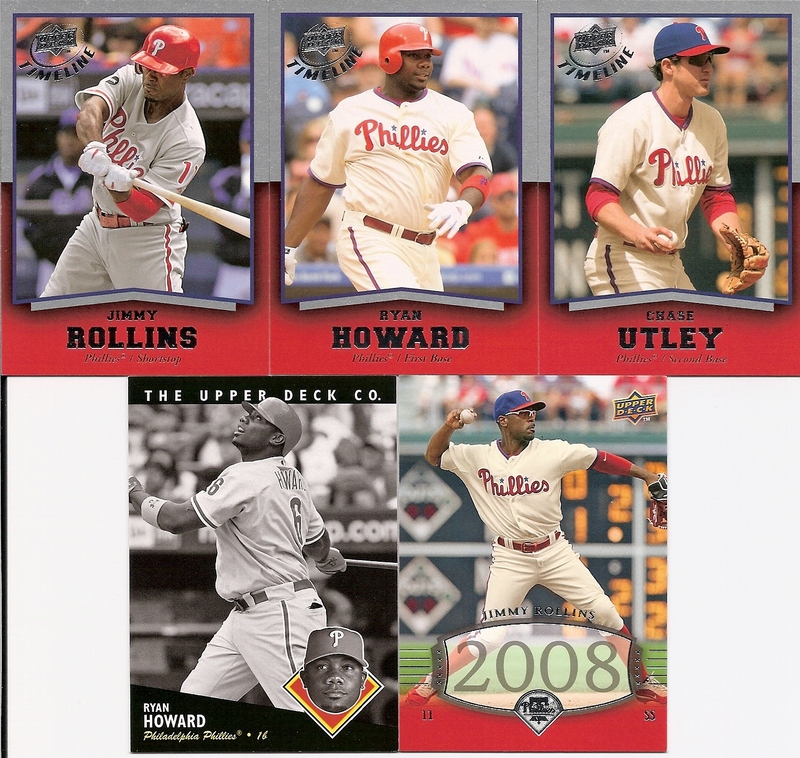 2008 UD Timeline is next on the block. I don't think I quite understand this set, mainly because I never tried to. Insane set collectors, all five of these cards (yes, including the two SPs at the bottom) are for trade. When your PLANNING CRASH!es, remain FEARLESS. Perhaps that's what Fleer is trying to teach us. 1996 E-XL. All available. Please, please, please let me need one of these cards! 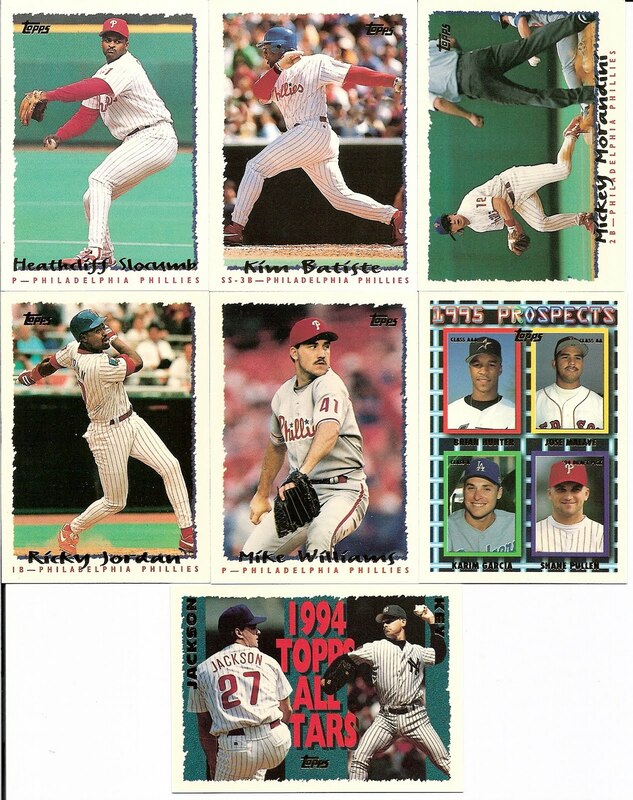 This is 1997 Pacific Prisms, and if I remember right the "base" cards are the fancy ones. The other three cards are Gems of the Diamond. And all of these cards are available. Well, the Phillies were a bust, but as always this was a fun break! 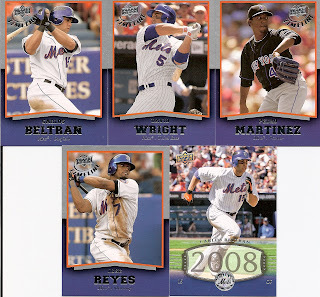 I bought into the Mets, too - I'll post those tomorrow. 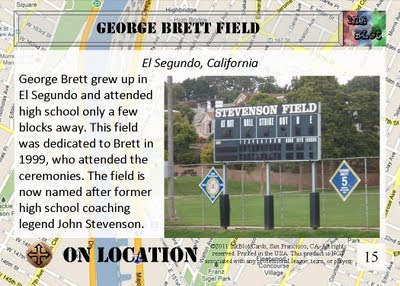 George Brett had three brothers, who also attended El Segundo High School. John Stevenson is the winningest coach in California high school baseball, and passed away in January of 2010. 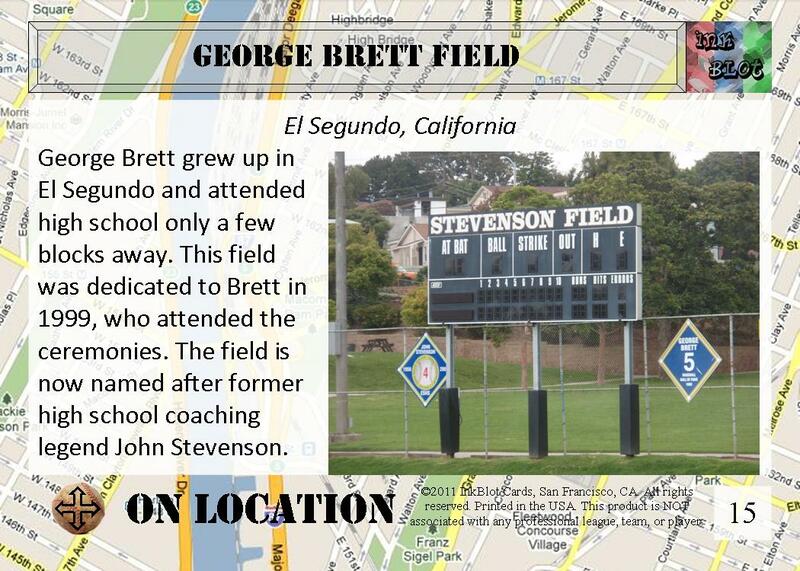 He coached El Segundo for 50 years. A long time ago, in a blog far, far away, Matt of Cardboard Conundrum and I participated in a really big fun game. I won some Triple Threads cards, and Matt won a really cool different card I wanted. A month and a half later, the trade is completed! I sent him a little box of cards, and he sent a big envelope! That envelope arrived last week, and now I can present to you the wonderful goodies that came my way. We start with a nice stack of Topps American Heritage. I wrote about this set before, when I learned that there were two separate releases, and I had only one of them completed. These cards start my quest to complete the second release. I think. I'm still confused about which set is which, and I'll probably need to reference a checklist to see which set I actually have. I do know that I don't have any of these inserts yet, so that'll help me out a bit! I remember when this set was released that the relics included actual space shuttle parts. I may have to get some of those. 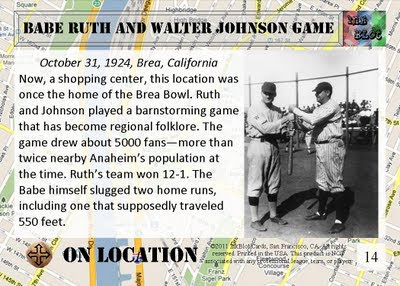 Continuing with the nonsport theme, Matt also included a lot of these Historical Moments subset cards from A Piece of History. I have part of the subset already, and these should get me fairly close to completion! 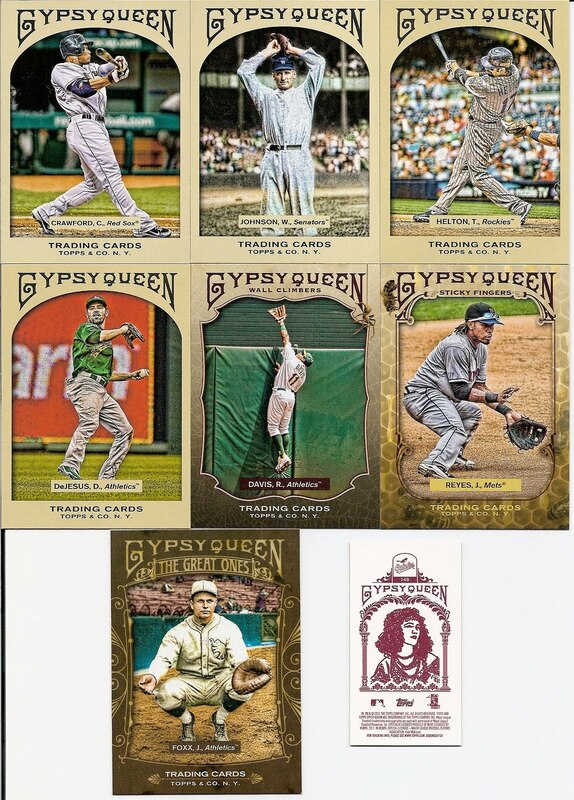 Next, some Gypsy Queen singles. 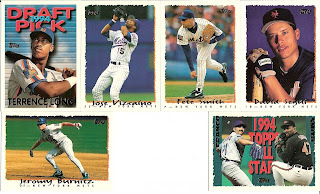 Four of the 17 cards I needed to finish my set are now in hand, as are these inserts toward the sampler collection. The red back mini is Adam Jones of the Orioles. I guess that's enough baseball, because it's on to the smaller sports - these cards (and a few more that I didn't scan) all feature women in the World of Sports set. I have a full set already but I can put together a separate set featuring just the women! 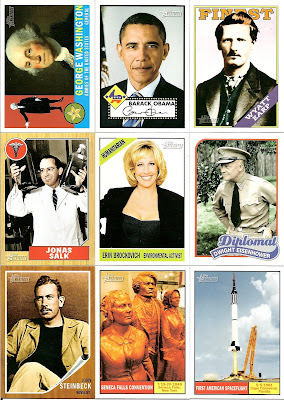 There are two cards specifically that I really want from this set - Nastia Liukin and Sasha Cohen. And the autograph versions too. I love these cards. I already have these two, but Matt offered them so I said OK. I still need a few in the 10+ card numbers, plus a couple #7 variations. This is the first card for me towards the 1992 Dairy Queen Team USA set. 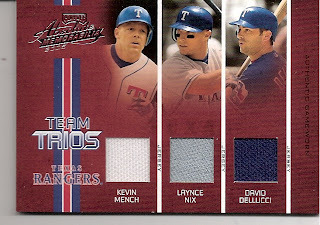 I have another one sitting in the sampler collection, but I've never found any to put towards the team set. 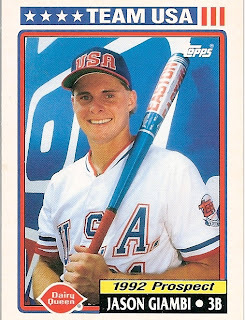 Has Giambi ever not looked like a geek? 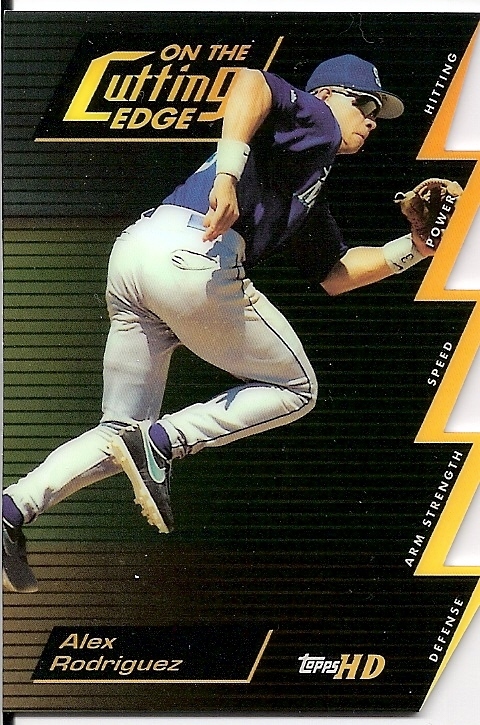 And the card that started it all. My scanner cut off the tips of the saw blade, but you get the idea. It's a really nice card! I have to tell you something - if I had any real graphic design talent I would have done a little homage post to the Saw movies using this card as the trap. 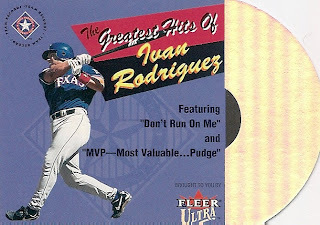 I want to make a new graphic for this site to replace the Topps card as the header, and so far I'm not doing too well. Thanks Matt, for the great package! I hope you enjoy your side of the trade! 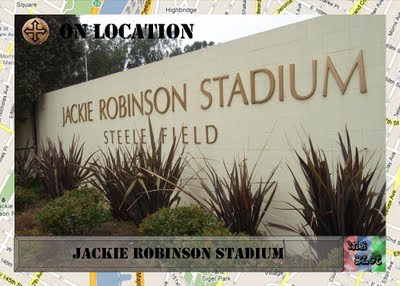 There is no evidence of the stadium's existence, as the shopping center and housing has replaced the stadium site. In researching this card, I discovered that there is an automotive center somewhere nearby that still exists, which can be seen in the background of one of the photos taken at or around the time of this event. 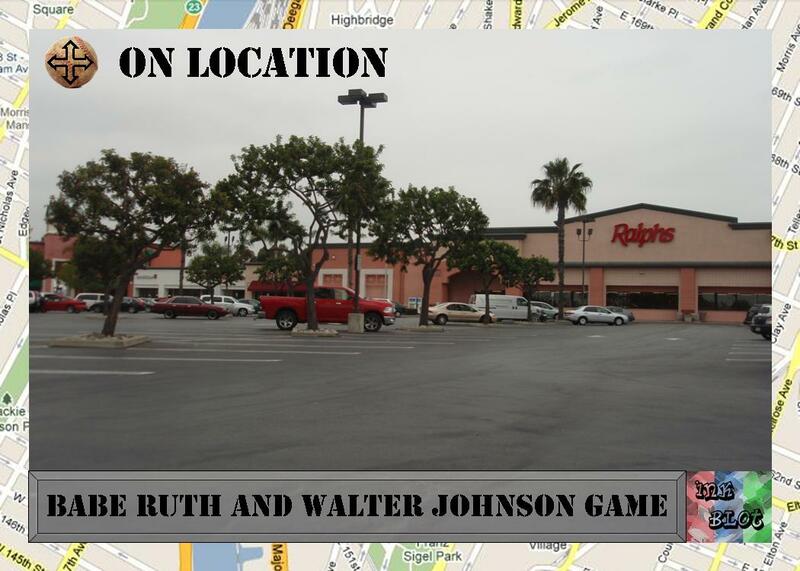 The black and white photo is from the game. You don't have to be 18 or older to vote in my election! You just need to have an opinion! Vote! The poll is on the left side of the page! If you have no idea what my title references, watch the video (or, more accurately, listen to the song). I have no idea what exactly da hee is, but I like the song anyway. Anyone remember Missy's video where she was wearing the hefty bag? Here are the awesome hits I picked up at the card show last weekend! 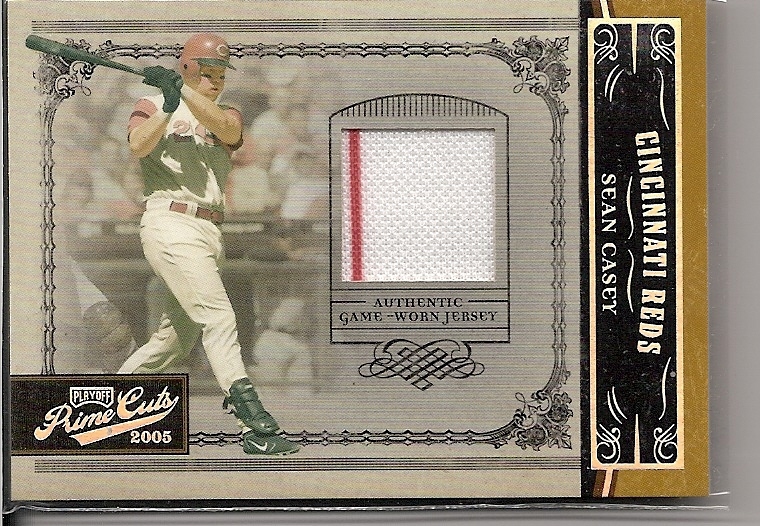 2005 Prime Cuts Jersey of Sean Casey #43/50 kicks off this party. This should be going in a specific trade. If not, I need it! Triple jersey from 2005 Absolute Memorabilia, featuring three Rangers. 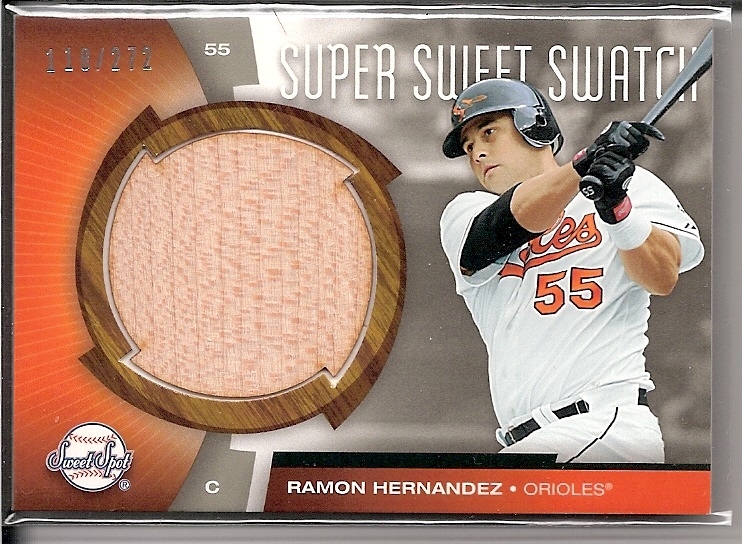 But it's numbered 41/50 and I bet there's someone out there who wants this in trade! I'm not sure you can call a sliver of wood a "swatch" but this is 118/272 from 2006 Sweet Spot. 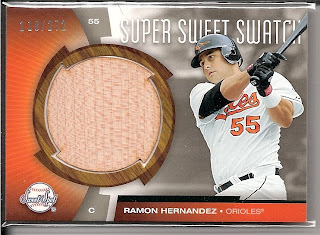 This "Super Sweet Swatch" is ready to be traded for ... well, make an offer! Not everything in today's post is for trade. 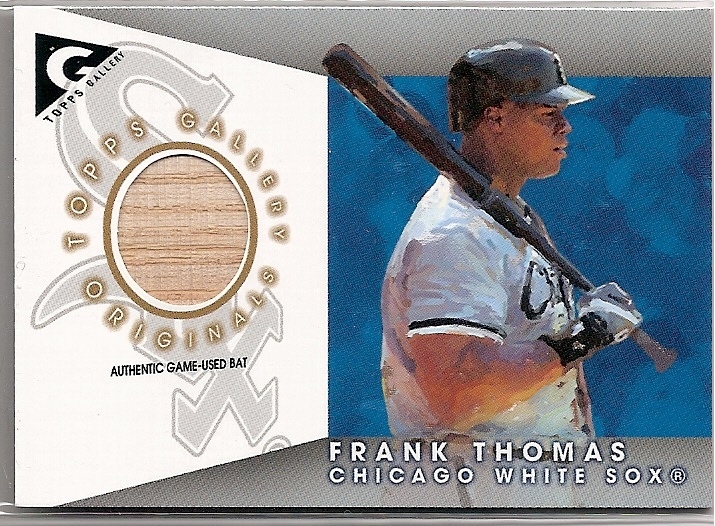 This Frank Thomas bat is going towards the eventual player collection! You didn't think I'd spend all this time posting all this stuff if I didn't have an awesome looking patch, #06/25, did you? Okay, I would have made the post anyway, but that's an awesome patch. I need this card for the samplers. 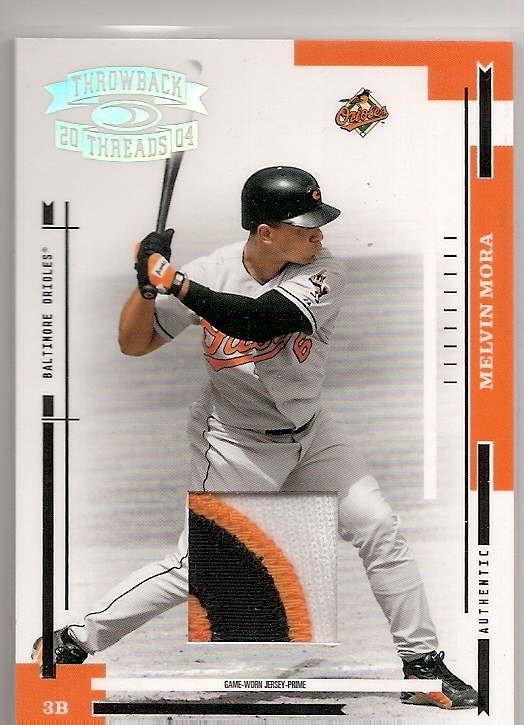 Last, #32/92, a card from one of my favorite memorabilia sets. 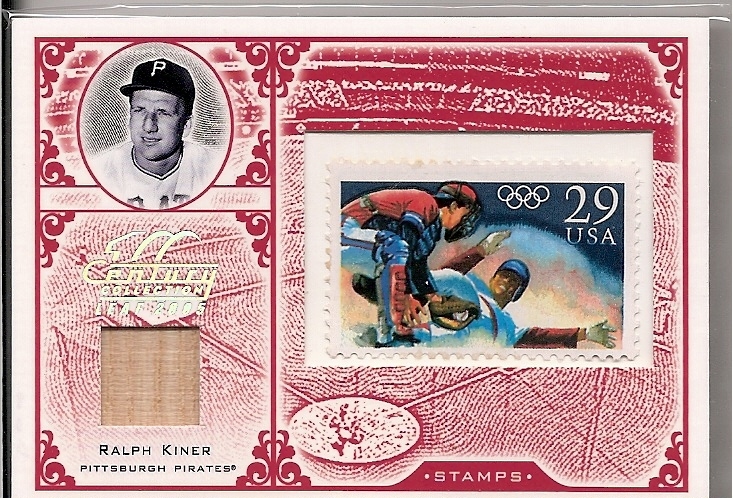 That's Ralph Kiner up in that little picture. 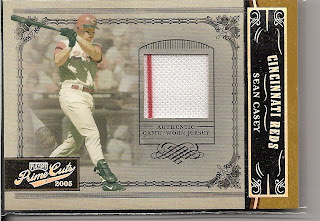 This card is for trade - I'd prefer one of the "Legendary" stamp cards from the same set. I'm happy with the spread I brought home last weekend and I hope you enjoyed this week's postings! After all the cards added to the sampler collection this week, I'm up to 17.365%! 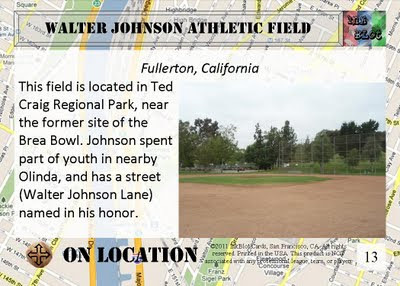 Side note: the field itself is a traditional rec field, sitting in a very large, quiet regional park. 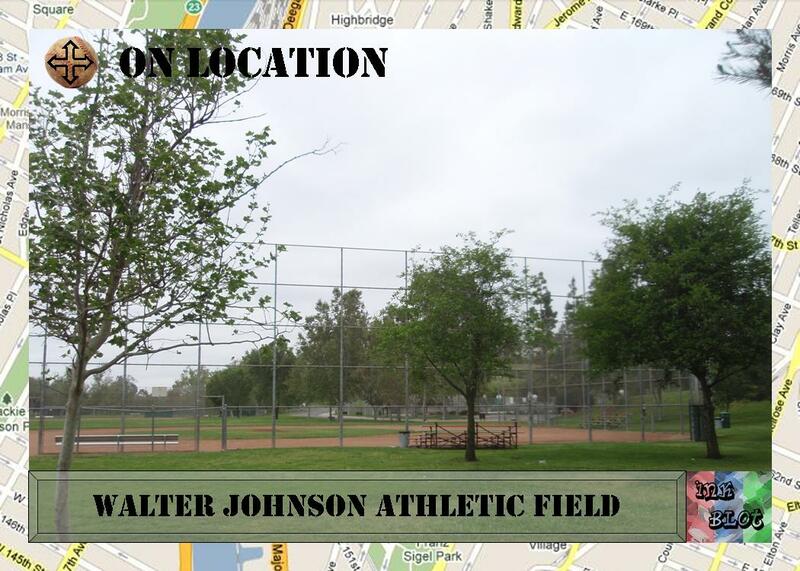 Visitors will either have to pay to drive to the field, or walk approximately 1/2 mile from the (free) street parking. The walk itself is enjoyable, following a stream. 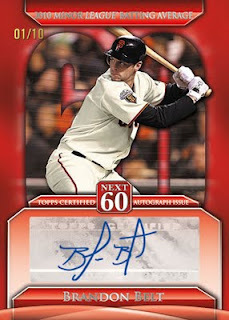 Images and details have just arrived regarding Topps Update, weeks before Series 2 even hits the shelf. Scheduled for release in October (as usual), the set will contain the expected 330 cards, including 55 rookies and the usual All-Star highlights and traded players. Workout jersey relics return. I like the desert motif in the background - one thing Topps seems to really do well is theming the All-Star relics to the location. With workout jerseys come workout patches. Again, the desert theme looks great. But there's nothing new here - All-Star jerseys have been used for years. Here's something new - sort of. Next 60 will be (you guessed it) hot rookies done exactly the same as Topps 60. This preview image shows a 1/10 serial numbering and the card is in red, but I have no idea yet if this is a parallel. Returning from the regular set will be the manufactured glove patches, more Diamond Duos (I have had enough of them and I haven't even seen series 2 yet), Kimball minis, Topps 60, sketches (including ones done by players), silks, and more of the 60th Anniversary autographs. 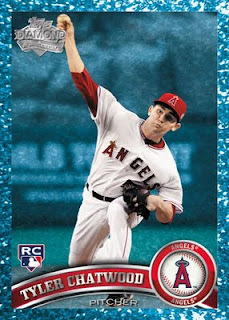 The diamond parallels will continue, and new in the Update set will be two additional parallels. The blue parallels will be known as Hope Diamonds. The burnt sienna parallels will be known as Cognac Diamonds. "But wait! 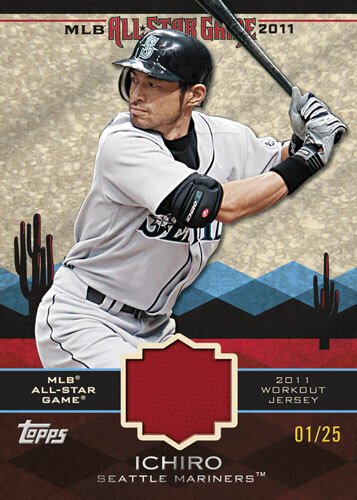 Ichiro didn't change teams this year, and I want him in a Hope Diamond parallel!" you say. 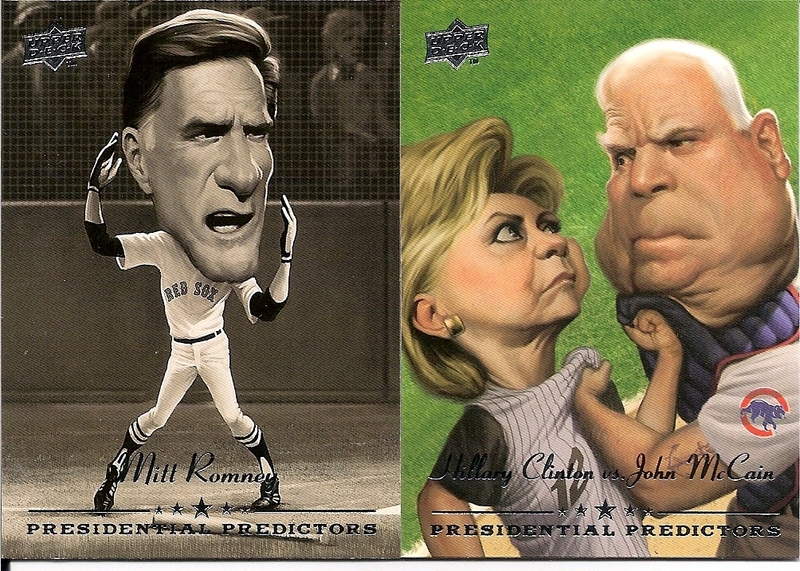 Well, fear not, because Topps is inserting Hope and Cognac parallels for series 1 and 2 into Update packs. This means that jumbo packs will have a whopping 4 parallels in each pack. No word on other packaging methods, though apparently regular packs will have only 10 cards each. And there's no word on how limited these two new parallels will be. 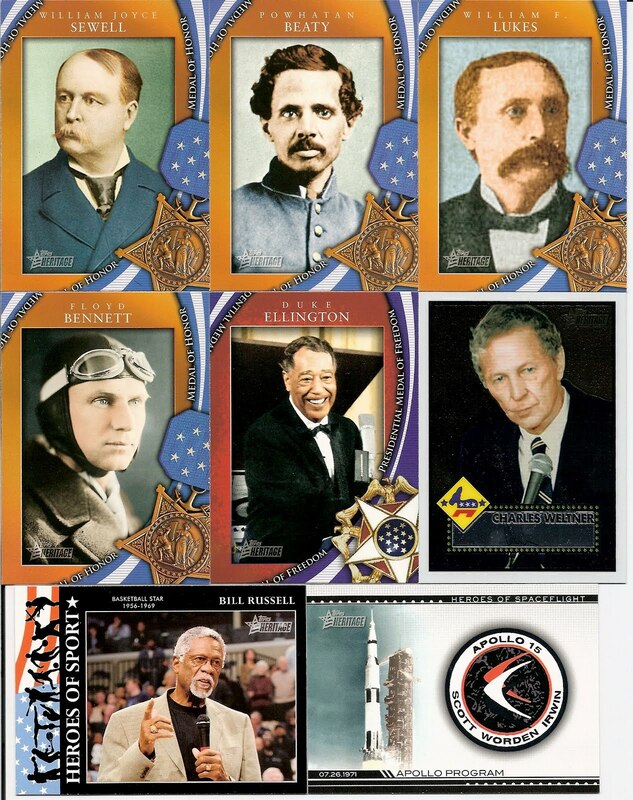 I like the look of the blue Hope Diamond parallel image, but this is something that should have been done from the start of the year, or not at all. I have to wonder if boxes containing regular packs will have more packs or perhaps a separate "parallel" pack. 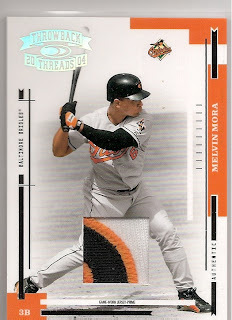 This Card Is Cool brings you the sets I find worth collecting. This is sixth in the series. 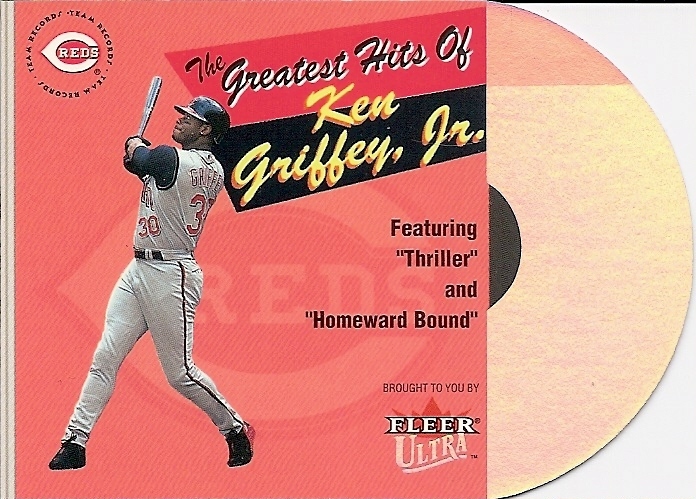 The Greatest Hits set features ten players in regular and platinum (serial numbered to 10) versions. The cards are made of sturdy plastic, and die cut on the "CD" or "record" side of the card. 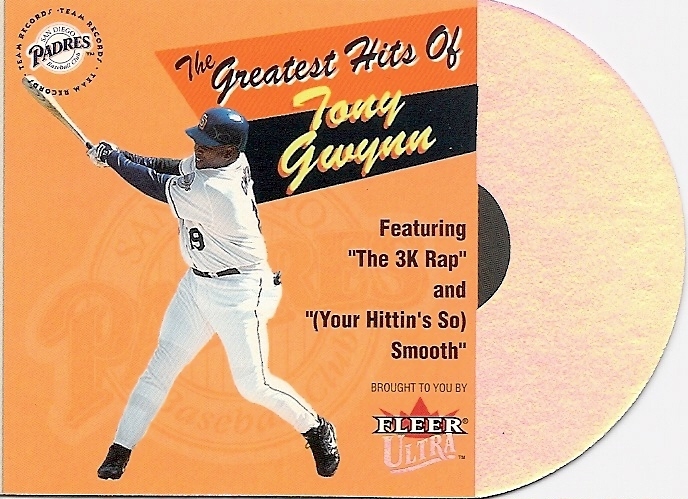 As you can see from the images, the card is meant to replicate a record album falling out of its cover. 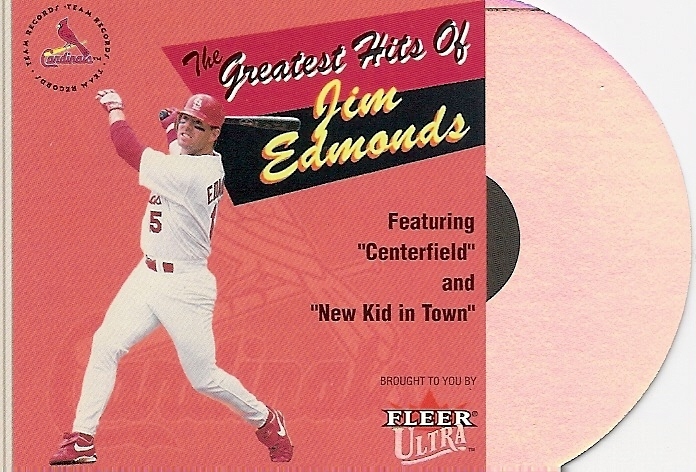 Keeping with the theme, two "feature songs" are advertised on the front of the card, and many of the songs are actual hits by other artists. 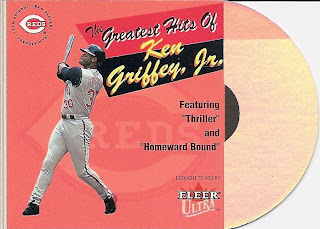 Griffey Jr. features Thriller, Jim Edmonds rocks out to baseball classic Centerfield, and McGwire is the Sultan of Swing. 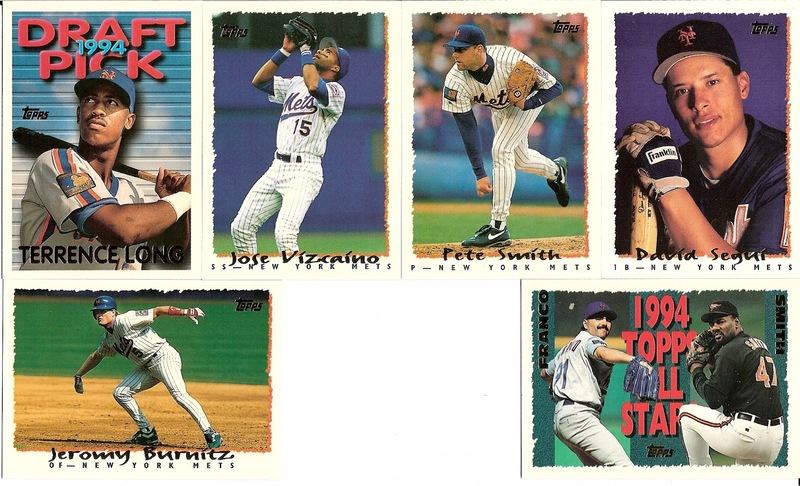 Five cards are shown here - missing are hitters Alex Rodriguez, Cal Ripken, Todd Helton, and Derek Jeter, and the only pitcher in the set, Pedro Martinez. 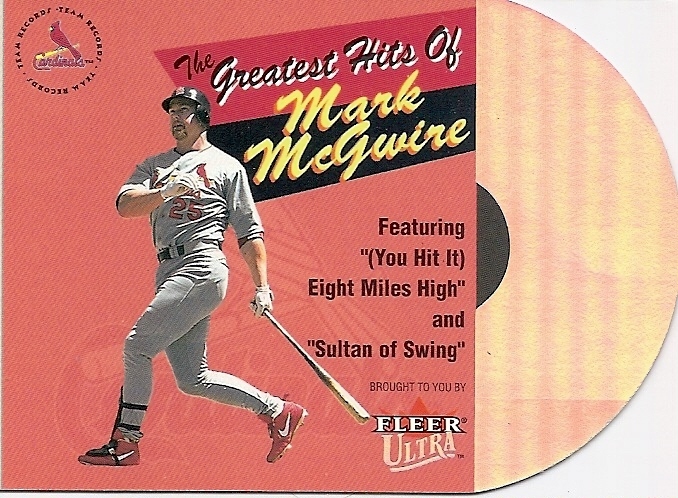 The card backs continue the musical theme, with short paragraphs explaining how "rocking" each player is on the field. While the concept is done as a tongue-in-cheek cheesy homage to classic album covers, it's a unique concept that is well executed. This is not the first card to follow a music theme. 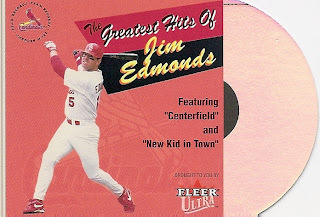 Leaf released a CD-inspired Frank Thomas Greatest Hits set in the 1990s, and baseball cards that were actual playable records were released in the 1980s (and probably before). If someone were to revisit this set today, who would be in it, and what would their two songs be? I think Tim Lincecum, were he in the set, could have the hits "Light My Fire" (Giants fans will get the double reference - if you know both reasons why I picked this song comment below) and "Freak Out". May Card Show Pickups: A Honus Wagner T206 card?! Quick poll on the left side margin! An enjoyable afternoon surrounded by vintage! Going Postal 11: No, Really, I'm Nuts! Going Postal 9: Kuntzs and LaCocks! LA or (Pack) Bust 15, The Finale!